Music on Hold allows you to upload an audio file to play for your customers while they are on hold, in queue, or being transferred. Nextiva offers three music options, available to listen to below. Follow the instructions below the Music On Hold examples to set up this feature. 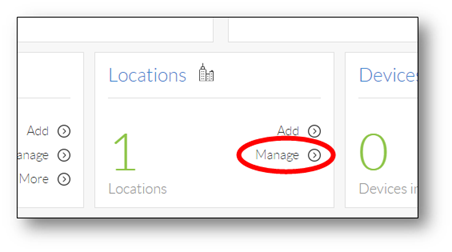 From the main dashboard, select Manage in the Locations tile (Figure 1-1). Hover your cursor over the location for which you want to configure Music on hold, and select the pencil icon to the right (Figure 1-2). Scroll down and select the Location Features section (Figure 1-3). Select the pencil icon to the right of Music on hold (Figure 1-4). 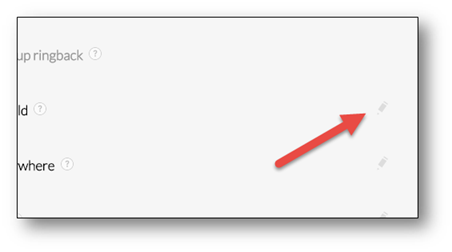 Hover your cursor over the Default entry, and select the pencil icon to the right (Figure 1-5). Department: This is the department within the location that will utilize the selected Music on hold file. Do not select a department if you want the Music on hold to be used for the entire location. 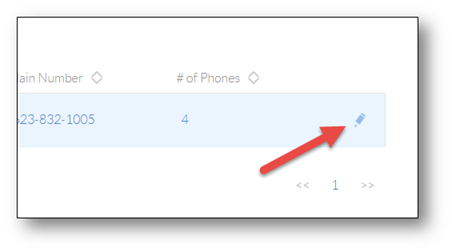 Enable music during Call hold: Select this check box to play music while a caller is on hold. This option is selected by default. 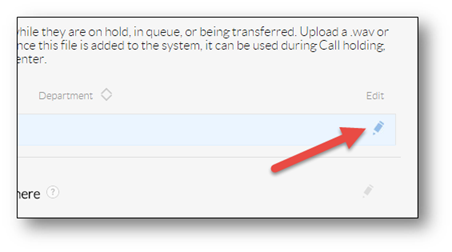 Enable music during Call waiting: Select this check box to play music if you receive another incoming while you are already on the phone. This option is not selected by default. 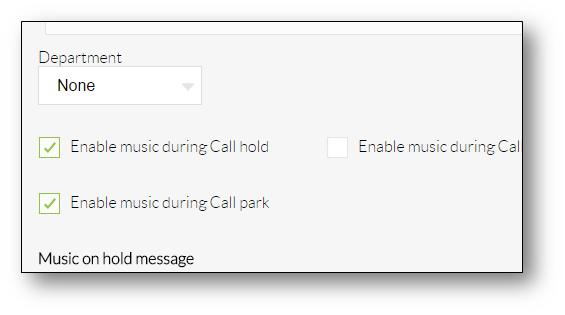 Enable music during Call Park: Select this check box to play music when you park a call. This option is selected by default. 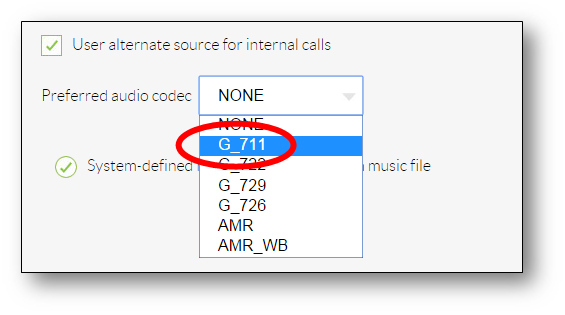 Preferred audio codec: Select G_711 from the drop-down list. 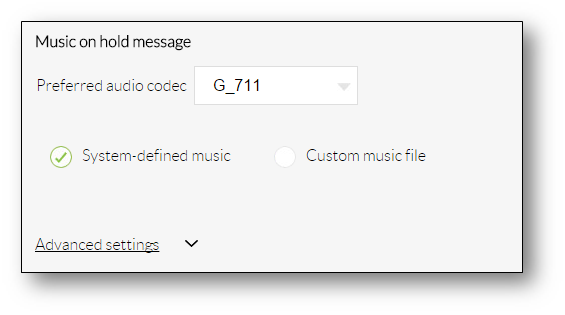 This is the only audio codec supported by Nextiva, click HERE for more information on what types of files are supported for Music on Hold (Figure 1-7). 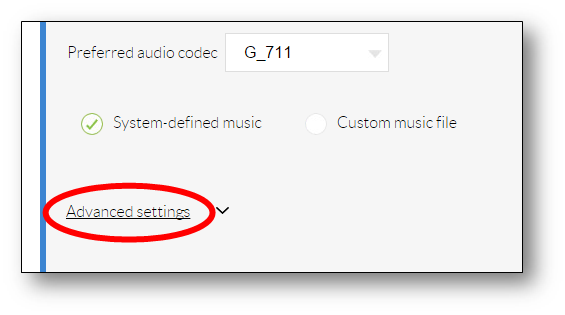 System-defined music: Select this radio button to use the system default music on hold. To hear what this sounds like, call into the location's phone number, and put yourself on hold (Figure 1-8). Custom music file: Select this radio button to specify a custom music file that should play when callers are placed on hold, and then select the file from the drop-down list to the right. 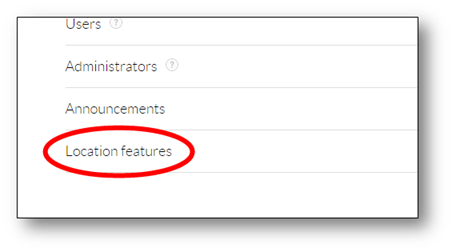 If you do not see any files listed, you will need to upload a file to the Announcement Repository. Click HERE for instructions on how add files to the Annoucement Repository. Example music available below. Select the Advanced settings link at the bottom of the Music on hold menu (Figure 1-9). 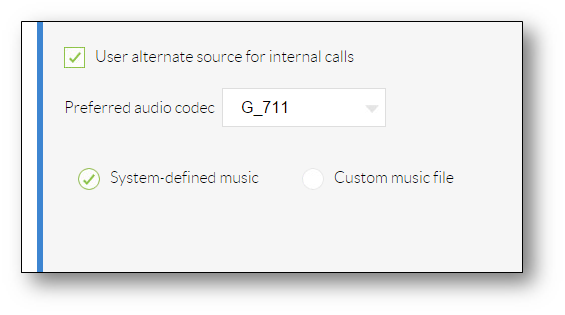 User alternate source for internal calls: Select this check box to have a different music file play for internal callers (other users on your account). 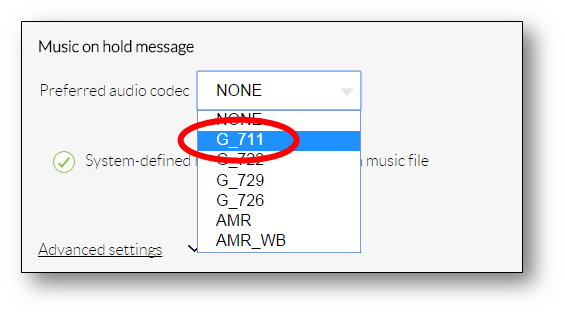 Preferred audio codec: Select G_711 from the drop-down list. This is the only audio codec supported by Nextiva (Figure 1-10). 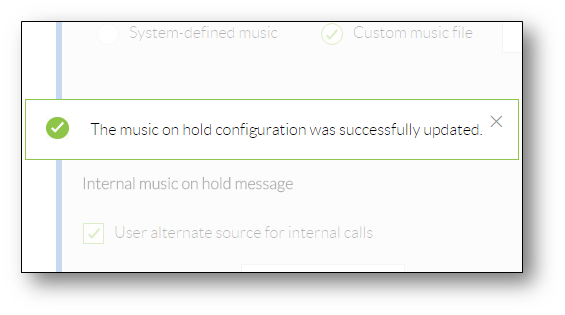 System-defined music: select this radio button to use the system default music on hold. To hear what this sounds like, call the location's phone number, and put yourself on hold (Figure 1-11). Select the green Save button at the bottom of the Music on Hold menu. A pop-up message appears stating the music on hold configuration for the location was successfully updated (Figure 1-12). The new Music on hold settings will be changed immediately, and any calls placed on hold after completing these steps will hear the new hold music.